The white barrels are random, which makes it a huge pain! Bad luck can add 10+ seconds. This video focuses more on the platforming. RNG is decided the frame you enter the level. Not all ghost barrels have the same chances of giving perfect luck. As an example, the 3rd ghost barrel has a 66% chance of giving perfect luck, while the chances of the 1st ghost barrel giving perfect luck is much lower. The worst possible luck for all the ghost barrels are 4-4-5-5-3-4 respectively. Keeping this in mind, you can preemptively jump into a ghost barrel if you're getting luck this bad. At 0:29, you need optimal movement to reach the next ghost barrel before it disappears. Remember to glide into the ghost barrel at 0:32 if it is facing the correct direction. Getting in between the ghost barrel at 0:36 can be tricky. 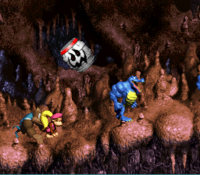 After leaving the barrel at 0:35, start a roll and do a tiny jump when Dixie is under the Banana bunch. 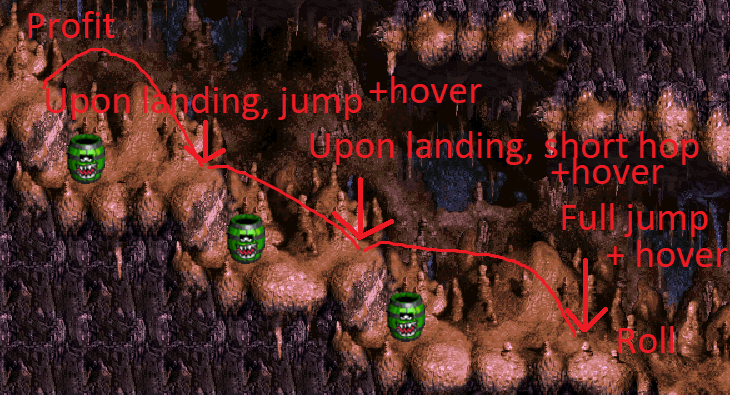 Then, simply buffer a glide (glide at the peak of your jump). The movement at 0:53 sets you up to skip a ghost barrel cycle. Positioning is quite precise, as alerting the 3rd green barrel too early will cause problems. The ghost barrel at 1:08 can be reached if it is initially facing the correct direction. This is much more difficult on U than it is here, on J. For the last roll if u start the hover close to the ground you get a quick roll. This page was last edited on 9 March 2019, at 16:10.